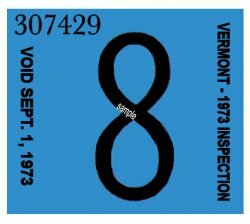 1973 Vermont Inspection Sticker - $20.00 : Bob Hoyts Classic Inspection Stickers, Add a Final Touch to your Restoration! This 1972-1973 Vermont inspection sticker was carefully restored and reproduced to completely remain faithful in color and size, front and back, to the original. It has a new modern "Peel and Stick" adhesive to place it on your inside windshield like the original. We are not certain if Vermont had six month or 12 month inspection periods. Either way, with an early month, the sticker would have been issued in 1972. For an additional $5.00 we can change the month on the front of this sticker. Also for an additional $10.00 we can add an antique license plate number to the top front of this sticker where the serial number now appears.